To help protect Victoria's environment, marron (Cherax tenuimanus and C. cainii) and red claw crayfish (C. quadricarinatus), freshwater crayfish species, are declared noxious aquatic species in Victoria. It is illegal for a person to bring into Victoria, or take, hatch, keep, possess, sell, transport, put in any container or release into protected waters1 noxious aquatic species. As the noxious species listing only applies to marron and red claw crayfish that are alive, if you are in possession of dead specimens, you would not be committing an offence.A Noxious Aquatic Species permit, issued by the department, is required to possess live marron and/or red claw crayfish. Why are these species listed as noxious in Victoria? Marron and red claw crayfish are declared noxious aquatic species in Victoria because there is concern that, if these species were freely available in Victoria, animals might escape from captivity and establish feral populations in the wild to the detriment of local biota. Marron has already proven that it has the ability to establish in Victorian waters; a healthy population occurs in a reservoir on the Mornington Peninsula. There is the potential for marron and red claw crayfish to pose a threat to native crustacea, such as spiny freshwater crayfish, through increased competition for prey and habitat and the possible introduction of diseases. How do you Identify these Noxious Crayfish? Close up of marron head. Image courtesy of Department of Fisheries WA. Marron. Image courtesy of Department of Fisheries WA. Marron is one of the largest freshwater crayfish in the world and is native to Western Australia but in recent years its range has expanded considerably from deliberate introductions, both in Western Australia and in other States. Marron grow to a large overall length of 40 cm. They generally range in colour from jet-black to brown, but a cobalt-blue farmed variety is available for aquariums. Marron can be identified by viewing the head. They have two raised longitudinal ridges extending backwards from behind the eyes; two raised ridges extending backwards from each edge of the rostrum2; and one raised ridge in the middle of the two raised rostral ridges (five ridges in total). Marron has spines on the upper surface of the telson (middle "plate" or fan of the tail) whereas the local C. destructor (yabby) has none. Red claw crayfish is native to Queensland, Northern Territory and Papua New Guinea river systems. Mature males have a distinctive red patch on each of their large claws and grow up to 9 cm in length. Juveniles and female red claw crayfish do not have red claws. They have a smooth body which is greenish in colour. Redclaw are distinguished from other Cherax species by having two longitudinal ridges extending backwards from the rostrum2 and two ridges extending behind the eye (four ridges in total). How do Marron and Red Claw Crayfish Compare with Endemic Crayfish? Yabby. Image courtesy of Department of Fisheries WA. 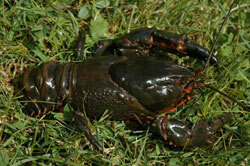 The yabby, C. destructor, is endemic to Victoria and is, therefore, not declared a noxious aquatic species. The yabby is also farmed in Victoria. 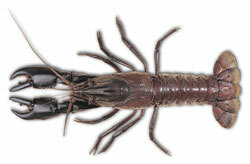 The yabby is much smaller than marron – it can grow to a maximum of 25 cm total length but are most commonly 13 cm. The yabby ranges in colour from a beige or coffee colour to almost black. They can also take on a blue colour when held in aquariums for a long time. The yabby has only two raised longitudinal ridges extending backwards from behind eye (two ridges total). They also have short rostrums2 with no spines, and yabby claws are large and have a distinctive mottled pattern and a thick mat of hairs covering serrations. Other Victorian native crayfish that should not be confused with marron or redclaw include the spiny freshwater crayfish, of which there are a number of species, and the Geocherax species. To distinguish between these endemic species and marron and red claw crayfish, look for the distinguishing features of marron and red claw described above. What Should I do if I Possess Marron or Red Claw Crayfish? If you are in possession of live marron or red claw crayfish and you do not hold a current Victorian noxious aquatic species permit, you are committing and offence under the Fisheries Act 1995. Humane disposal of crayfish involves freezing the animal for a minimum of 20 minutes. The animal is assumed dead if no movement is detected when handled. The tail should hang limply. Even if assumed dead, do not dispose of the crayfish in Victorian waters.Department of Fisheries WA. To apply for a Noxious Aquatic Species permit, contact the Customer Service Centre on 136 186. Permits can only be issued for a specific range of activities; the ornamental fish trade is not one of them. For more information, go to the Noxious Aquatic Species Permit Policy Statement page. 1 "Protected waters" means (a) Victorian waters; and (b) any aquarium or hatchery or any other waters in Victoria whether or not private property. 2 Rostrum – The long spike that sticks forward from the head between the eyes. Tarmo Raadik, Freshwater Ecology, Arthur Rylah Institute, Department of Sustainability and Environment.